Welcoming, friendly, authentic. These are some of the traits that we aspire to live up to every day in the brewery and personally. Being able to meet people from diverse walks of life and connect with them over a tasty beer is one of the greatest rewards of our profession. Wanting to celebrate the ideas of personal connection and community, and in honor of June being Pride month, we decided to make a fun beer to celebrate love and connections. Zesty! is a tart ale brewed in the style of a Berliner Weisse. Coming in at 3% alc. by vol. and with balanced doses of grapefruit and blood orange fruits, Zesty! is light, bright and refreshing. Celebrate the release of Zesty! at the brewery on Saturday, June 9th at our Pucker Up! sour event. 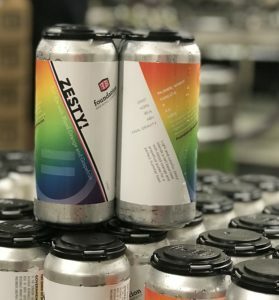 We will be donating $1 from every sale from our tasting room of 4-packs of Zesty!, 10oz samples and Pucker Up flights to Equality Maine and Pride Portland. Check our website on Saturday for an up-to-date tap list. Thainy Boda and Steindry will be serving up tasty treats on the patio. Continuing the party…. we are celebrating the culmination of Pride week with Zest Fest at Novare Res Bier Cafe on Saturday, June 16th. All day on the patio, Zesty! cans will be available with Novare donating $1 from every can and a like-match from Foundation. Fun Zesty! events will continue all day around town at Arcadia National Bar, Blackstones, Flask Lounge, Highroller Lobster Co and Thirsty Pig, with similar donations. Thanks for being you! Keep it Zesty!